All transactions are safe and secure with a reliable history in online purchasing behind each of our associates. 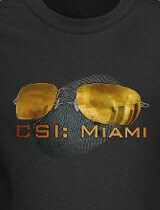 Buy the CSI Miami t-shirt to own CSI clothing and merchandise. Does CSI Miami's Horatio Caine (David Caruso) epitomize the word cool? We think so. Now you can evoke his coolness with this stylish Horatio Caine CSI t-shirt that features his sunglasses and a logo for the TV show. Wear it to recite Horatio Caine quotes from the show like, "We never close!" Horatio will never stop searching for justice. Pair this tee with a pair of Horatio sunglasses and play the part. Browse through to see other Horatio Caine CSI t-shirts featuring David Caruso's quotes from the CSI Miami television show. In addition to the CSI Miami tee above, browse the CSI Clothing Gallery for more apparel like men's and women's clothes, kids shirts or hoodies.